Inshore diving, snorkeling and final open water training day! We took two clients out snorkeling with the seals at Partridge Point today, while others completed a dive with the seals and into the kelp forest at the same time as Amalia Stead (our open water student) completed her third of fourth dives for her certification. It was slightly overcast in the beginning of the trip and throughout our time at Partridge Point but that didn’t stop the success of the journey! We had lots of seal action at the rock for both the divers and the snorkelers. A birthday trip to remember for one of our snorkelers who traveled from Johannesburg to celebrate with us in Cape Town. Plenty of GoPro footage was captured by the divers and the snorkelers which showed the curious and adventurous seals frolicking in the light swell of the morning. After pulling anchor, we quickly headed back to the pier to bid our snorkeler friends farewell and then we took off for another dive. This time we anchored adjacent to Ark Rock. The skies cleared for this dive which gave us a nice warmth on our backs before we hopped in the water. 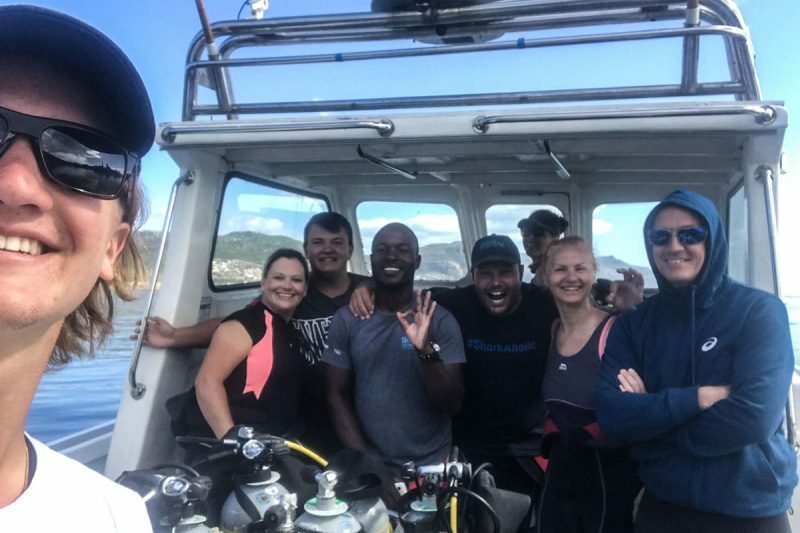 Two groups went down here, one for a recreational dive to find the pajama sharks, cat sharks and leopard sharks while Amalia splashed to complete her final certification dive. WOW! What an incredible dive for viewing sharks! There were countless pajama sharks, cat sharks and leopard sharks at Ark Rock today! They were very playful and a joy to be around as Amalia got to experience sharks underwater for her first time. Schools of fish passed by as we swam around the rock and peeked inside some caves to find more pajama sharks hiding in the dark. Overall, an extremely successful day on the water inshore diving. We saw plenty of marine wildlife, introduced some new friends to snorkeling while having unforgettable birthday and certified another diver to share her memories with family and friends.